"How can you not get romantic about baseball?" It's no secret that Hollywood has a love affair with baseball. From Field of Dreams to A League of Their Own, audiences have been enamored by the heart and soul of America's favorite pasttime for years. 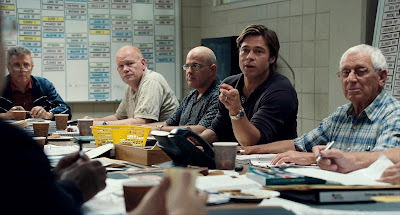 But with the newest addition to the baseball movie hall of fame, the Bennett Miller-directed Moneyball, audiences may finally fall out of love. Brad Pitt stars as real-life Oakland Athletics general manager and minority owner Billy Beane, who successfully assembled a baseball club using a groundbreaking method to draft players. And, according to this movie, that was the most interesting thing about his life. When we meet Beane, he is already trying to make his mastermind idea come to life, with little support from his peers, including Art Howe (Phillip Seymour Hoffman). So he hires recent Yale grad and analytical geek Peter Brand (Jonah Hill) as his partner in crime to help iron out of the kinks and make his dream come true. Then the movie becomes a numbers and statistics game. From analyzing extraordinary losses and wins in historical games, to watching old footage of historical power moves, the audience becomes lost in a sea of equations, baseball terminology and dollar signs. This drains any heart out of the movie it could have had. Beane's resilience, though it often comes off as blind arrogance, is commendable but doesn't make you feel anything for the character, who really seems more like a nifty businessman than anything else. 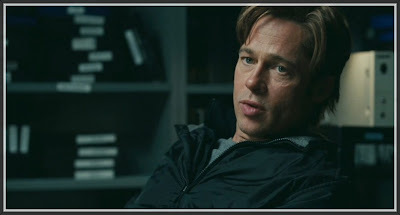 This is probably because the writing is so dry, it's impossible to feel any empathy, which is very uncharacteristic of screenwriting giant Aaron Sorkin, who collaborated with Steven Zaillian to bring Michael Lewis' book about Beane to the big screen. Unlike the movies that have come before it, there is no defining moment or noteworthy scene that audiences will want to come back to. A missed opportunity was not playing up the role Beane's daughter played in his life and their relationship. This would have humanized Beane and provided something the audience could really grab on to, rather than trying to impress the audience with boring math equations and woeful shots of games past. It would have also been more effective to provide more insight into Beane before he became this baseball scientist, whose glossed over relationship with his ex wife (played by the eternally underused Robin Wright) doesn't help to build any interest in his character. Jonah Hill, while his portrayal shows his range into more dramatic flair, is effective enough but unmemorable in the role. He seems more to be reciting lines rather than saying them with any conviction. But that may be in part due to the lackluster writing than his performance. 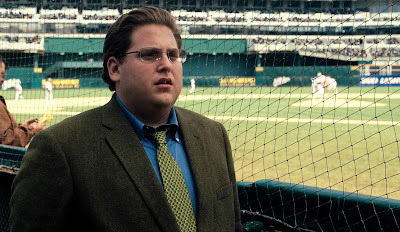 Like a long, boring game of chess, where hopeful baseball players are discarded as effortlessly as a pawn and a knight, Moneyball fails to provide the sentiment it needs to inspire audiences. Though it may charm avid baseball fans, it will alienate everyone else who's just looking for a good movie to watch. It may not feel quite like the classic baseball movie others have achieved, but it’s certainly pleasant enough to be enjoyable even by non-sports fan, and features great performances from Hill and Pitt. Good review Candice. BTW me likey on the new lay-out. I had no idea it was even your site in the first place.